During an interview, TTSA member Chris Mellon spoke about a UFO video. It took some doing, but eventually I was able to track down the video. It wasn’t easy, because I haven’t been able to find it on the internet… anywhere. Thanks to Mark for this lead and Giuliano Marinkovic for helping me figure out which video Chris Mellon was referencing. “I did tend to keep my eye out, and because I had this interest, and from time to time this issue would arise. Or I might be working with a colleague, for example, who had been the Senior Intel Officer at Spacecom. And I remember one night working with a Brigadier General whom had been the Senior Intel Officer at Spacecom in his last assignment, and so I… just you know, informally asked him about that and he looked at me sort of like, “What are you crazy?” He gave me this look like I had a third eye on my forehead and you know generally speaking it’s not an issue that is talked about or has a lot of credibility. You risk your own credibility if you express too much interest in it. So it’s just something that I quietly, you know, it was always in my mind because I had this interest, so I would keep my eye out for things, and occasionally that was something that would lead to something or bear their fruit. GIULIANO AND I FOUND THE VIDEO! There may not be enough to conclude either way whether these are a fleet of UFOs or meteors, but after the comments from Chris Mellon, this video is extremely interesting. Note: If you are having trouble viewing the video and clicked on the link via social media, exit social media and visit the webpage through your normal web browser. Dr. Maccabee no longer thinks its a UFO. This was sent in by John Greenwald. I believe Chris Mellon’s interview comments were from 2016. Mr. Mellon also mentioned the video to Leslie Kean in 2016. The Nightline episode has turned up! Extremely interesting. 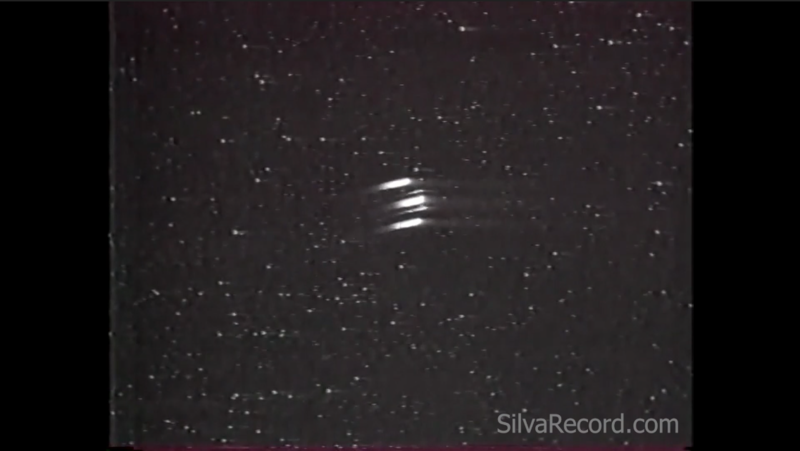 Upon watching this like 10 to 12 times over, and pausing once, it is extremely evident that this is *not* and I repeat *not* seemingly 5 separate objects streaking across the night sky. Meteors are out of the question. Incoming satellite as well. I believe this a solid one-piece object. How did I reach this? Study the object closely. Now if this was 5 separate objects (meteors, satellite breakup, space junk reentry) the rate of speed as they come through the atmosphere would cause each to slow down at different rates (assuming all have different masses, including the two smaller objects) due to buffering against the atmosphere as they come down, even at angle. Note the shape of it. It looks triangular, which one might say high altitude aircraft, but to me it seems more solid than that. Oddly similar to the 1951 Lubbock Lights (which might be a larger solid ship). I think cleaning up the video might give better clues as to what it might be. Nice work tracking that down! 1) The angular rate of speed for the slowest moving 11 km/sec meteor between 80 and 120 km away in altitude (assuming it to be directly above), would be moving about 5 to 3.3 degrees/sec. 15 to 10 degrees to be considered a meteor. 2) If we tilt the observation to 45 degrees above the horizon, those same altitude envelope ranges, are now about 112 to 170 km away, and speed of the meteor can be increased above the min of 11 km/sec min to 15.4 km/sec across the same screen configuration. Therefore, as we tilt the observation from the vertical downward toward the horizon, we can include faster moving meteors. Most importantly the angular field of view of the screen capture and secondarily the azimuth (angle above the horizon), we can’t yet eliminate or filter out meteors as the most likely possibility. Visibility on Maui to the horizon would be unencumbered by pollution. Great work Giuliano and Danny for tracking this one down!